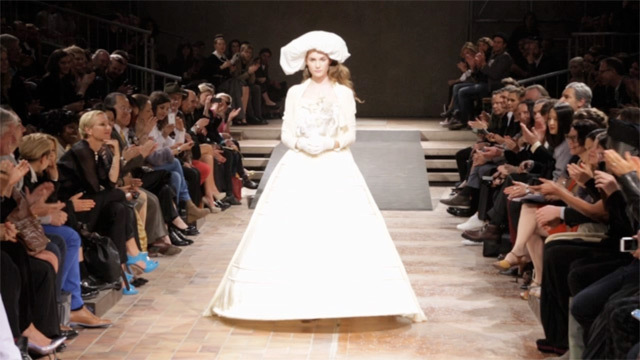 La mode fait son cinema from Elisabete Godart on Vimeo. Défilé Fashion Week Ken OKADA Paris "Les parapluies de Ken OKADA"
Last April 25th, designer and artist Yohji Yamamoto has presented, for the first time, his archive creations in Berlin, a city that he has himself defined as a source of inspiration and a reference on an international level for the art and fashion scene. Presented on the runway was a series of the most symbolic creations of his career. Sponsored by Audi as part of the renowned Gallery Week-end taking place in the German capital which attracts, every year, thousands of people, the fashion show was held in the heart of Kreuzberg, among the concrete walls of Saint Agnes church recently purchased by gallery owner Johann Konig. A ubiquitous presence on the Paris fashion scene for over thirty years, Yamamoto explores the frontier between art and fashion by way of avant-garde silhouettes that are able to interpret the personality of the wearer, regardless of the age, always with great tact. Following the exhibitions at Palazzo Pitti in Firenze, at the Louvre in Paris and at the V&A in London, Berlin pays homage to the work of the designer by celebrating – as the title Cutting Age suggests, his workmanship and the years characterized by his gracefully edgy creativity. Among the guests were designer Stefano Pilati and artist Alicjia Kwade. The 36 looks, selected from his most recent and past collections, were presented to a public of over 600 guests. The favourite colour and leitmotif of the show is black which delicately shares the stage with a few touches of vivid colours such as yellow and red. In addition to his signature use of sober details, what makes Yamamoto’s style recognizable is the profound analysis on the essence of women swear that constantly displays an artistic or intellectual – often androgynous – touch. The standing ovation of the public is yet another piece of evidence of Yohji Yamamoto’s role in fashion, and not only: that of a designer whose vision always conveys its message by means of a pure and atemporal style. My sincere thanks to Max Delorme and Yhoji Yamamoto, for the pleasure I had to participate in this event. Défilé Fashion Week Ken OKADA Paris "Hôtel LUTETIA"
Défilé Fashion Week Ken OKADA Paris "Les Rendez-vous Toyota"